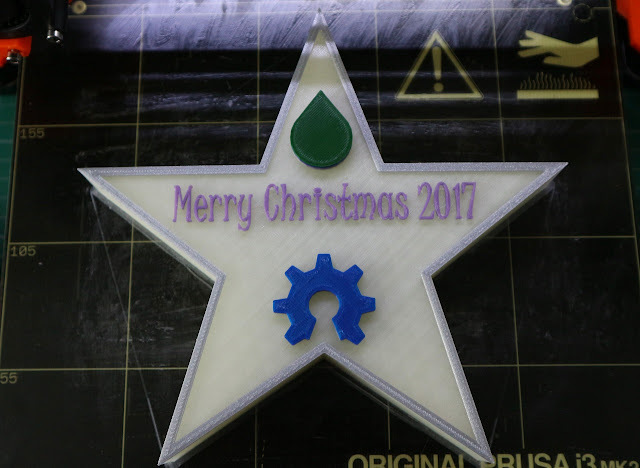 Christmas Day - Star in Glow-in-the-dark PLA from Prusa Research. Thank you all for reading and being part of this advent series with me, see you all very soon. Christmas Advent 2017 Download on Thingiverse here - designed by Tom Van den Bon @geekc0der With some help for each day by the South African Makers team. 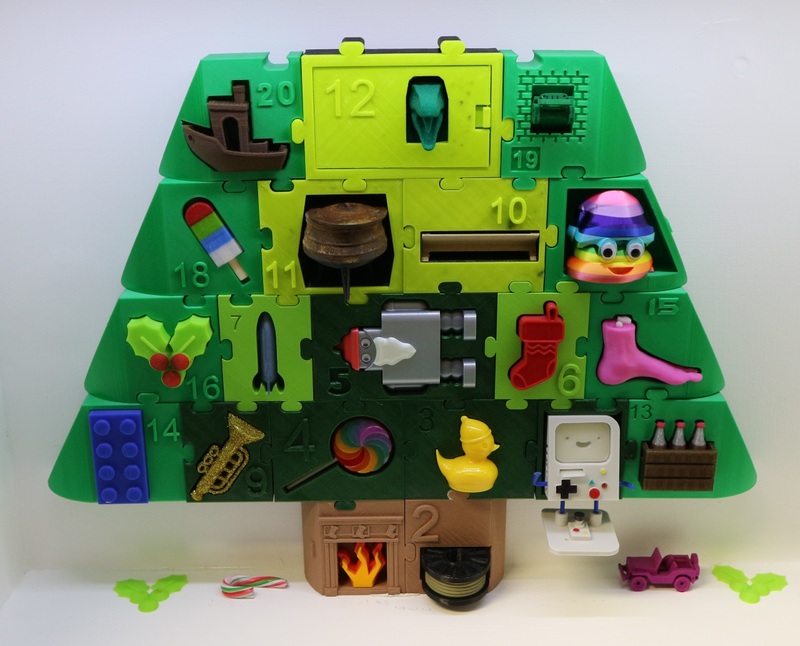 The original advent calendar from 2012 is on Thingiverse - designed by Peter Leppik. 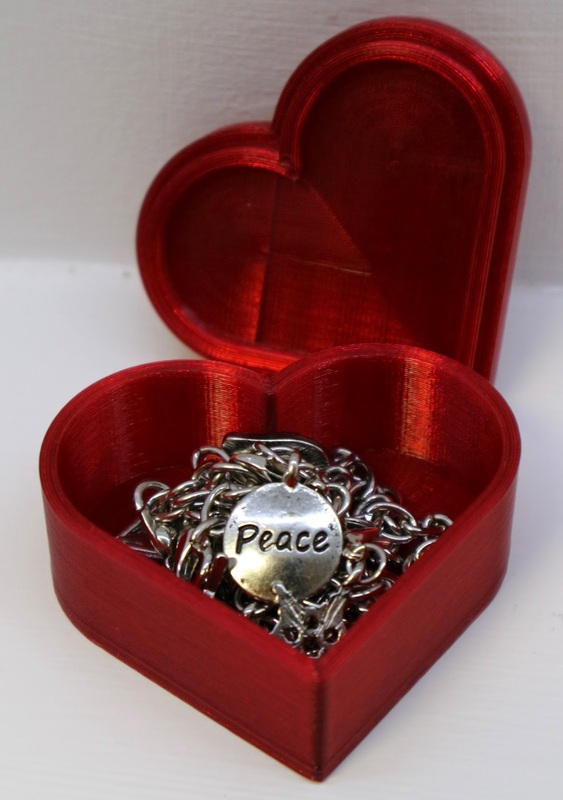 Day 23 gift is designed by Chris Venter - It's a Heart box printed in Ruby Red Taulman3D t-glase (Red Star). Yes! I finally get to use t-glase, this model is perfect printed in t-glase Red Star. Days 23 & 24 tree sections are printed in Polyalchemy Elixir. Small rolls, but amazing filament. t-glase from Taulman3D is one of my all time favourite materials to use. I always have some stock for projects like this. It shines and shimmers and can be used for LED light guides or just to look beautiful. Taulman t-glase with a Red laser beam catching the front edge. t-glase is a PETT based material. You are more often likely to find PETG (Glycol modified) versions of polyester (polyethylene) being sold by many manufacturers. 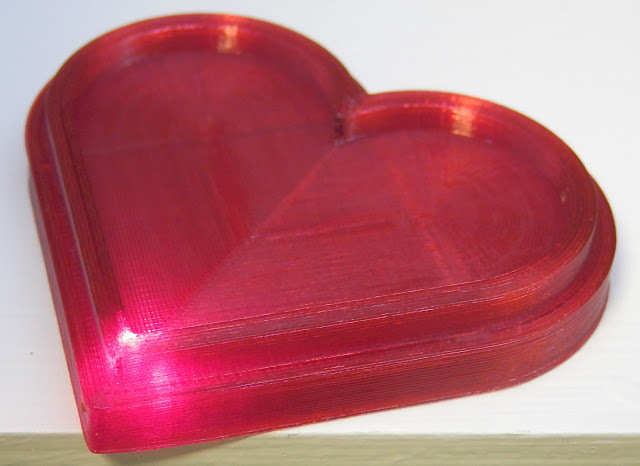 Both PETT and PETG can print very nicely in 3D printers, I tend to use PETT for high optical clarity, bigger layers and anything using light or for beautiful objects & gifts in general. 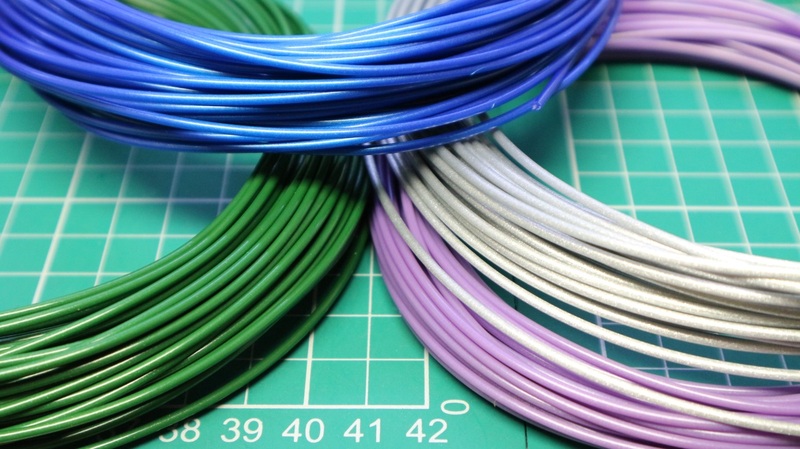 I will use PETG for large strong functional parts, you can get a semi-clear finish with PETG, some formulations can produce reasonable optical clarity with the right settings and nozzle size. 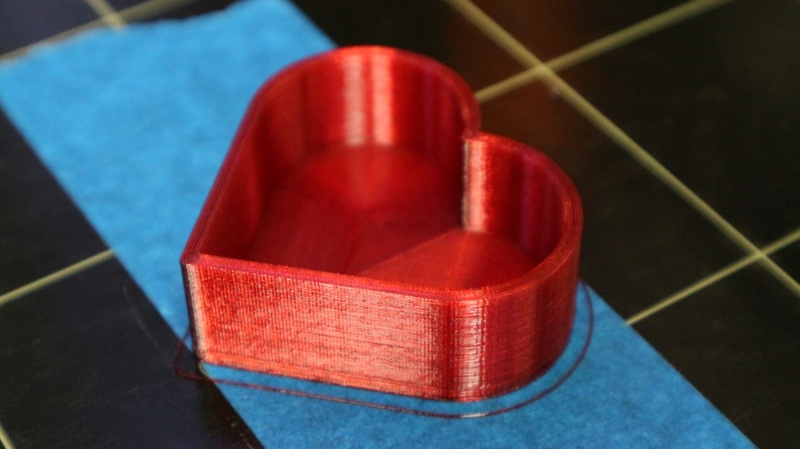 For this heart I'm keeping to a chunky layer height, and a specific infill type. Left shows traditional rectilinear infill, and right shows a concentric infill. 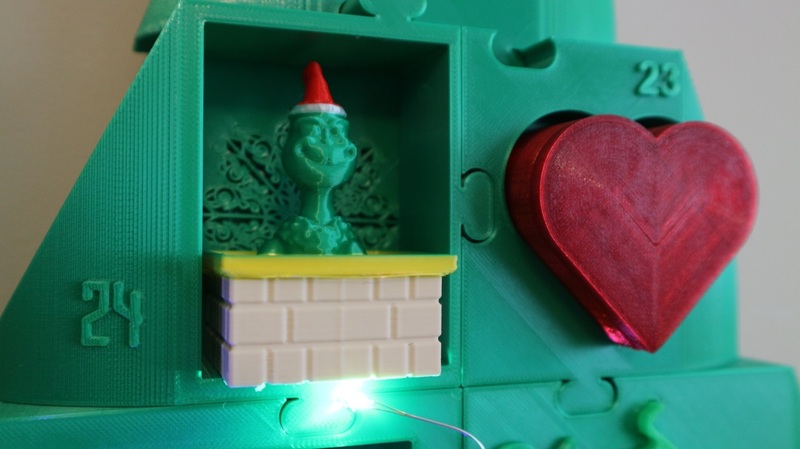 It's worth thinking about the first bottom layer for objects like the heart box. The lid will be the bottom face when assembled, so you want that to look as nice as possible. 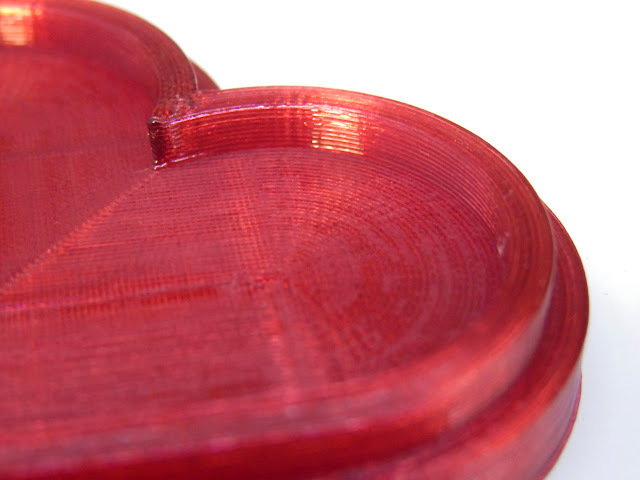 Likewise, the heart box bottom is also using a concentric infill. Look at those chunky 0.3mm layers, they look amazing on an object like this. 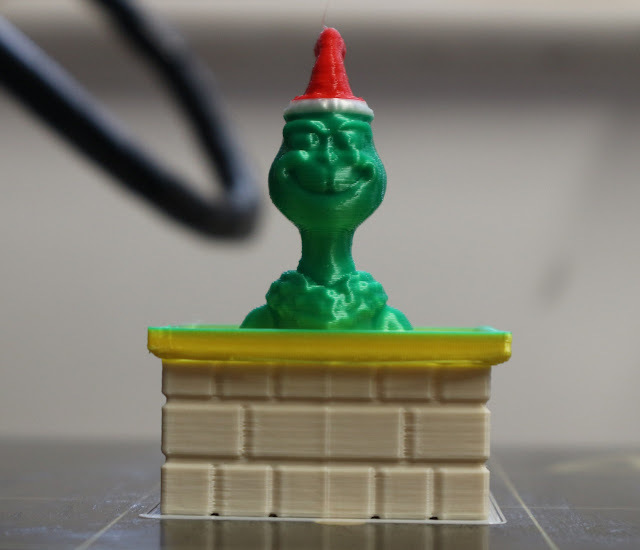 I also printed the final gift in the tree - Day 24 - The Grinch. I have absolutely no idea how the yellow overhang worked. This had no support and should have failed at this point, but when I came back after switching materials, it was done and asking for the next colour! I can only think it must be some Christmas Magic? Days 23 and 24 completed. What settings did you use? - t-glase needs some odd slicing setting. 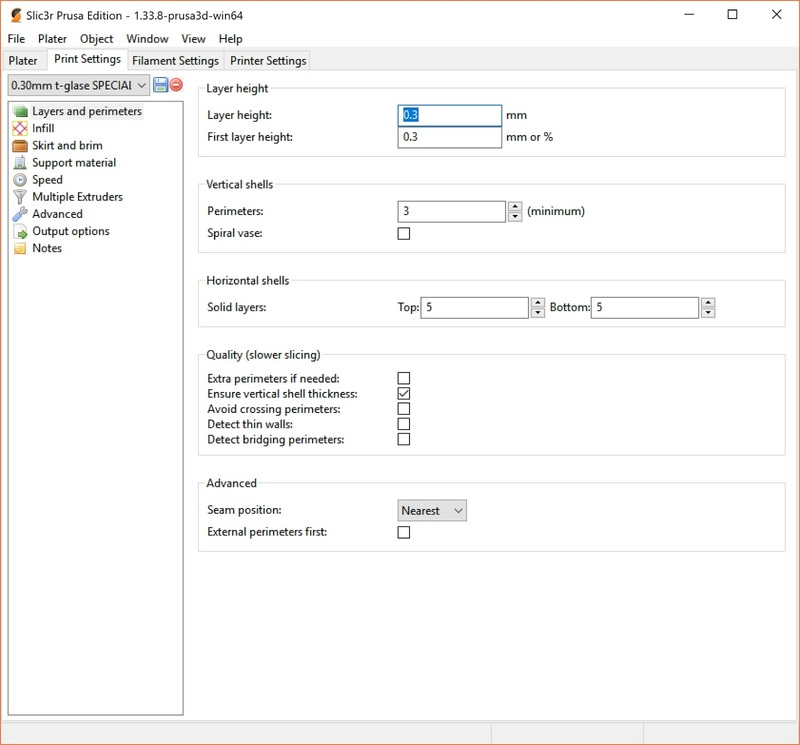 I will talk about a few, but as they are an odd mix of tricks and balance, I'll also include the Slic3r settings I use to help you tune t-glase perfectly. 0.3mm layers (0.4mm nozzle) work really well with t-glase / 5 top and bottom solid layers. Finally I'm using concentric for top and bottom layers, but that is because of the object here, you can use rectilinear if more appropriate. Especially the first layer, you want that to be neat and tidy for this object. 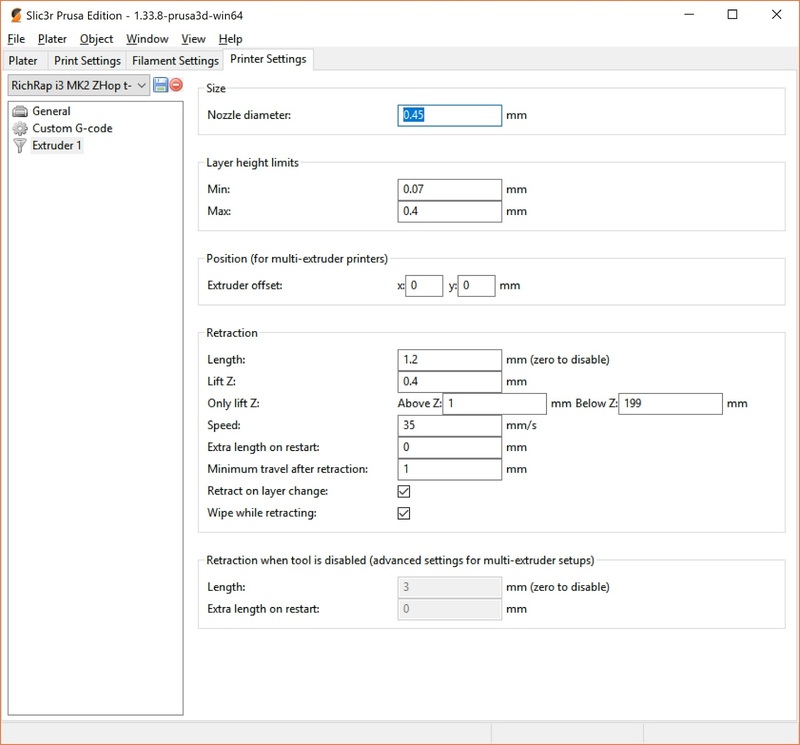 Make the extrusion widths around the same size as the actual nozzle size. Normally you would go slightly bigger. 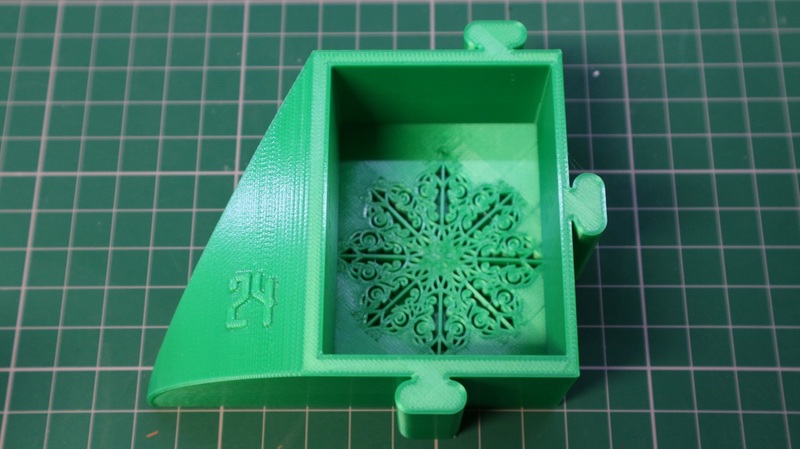 250 degrees C - it will print lower and hotter, but for the speed balance, this will give clear (not frosty) results during printing. 80 Degrees C heated bed. This is a really important one, don;t use too much fan cooling for t-glase. Max 40% unless bridging. 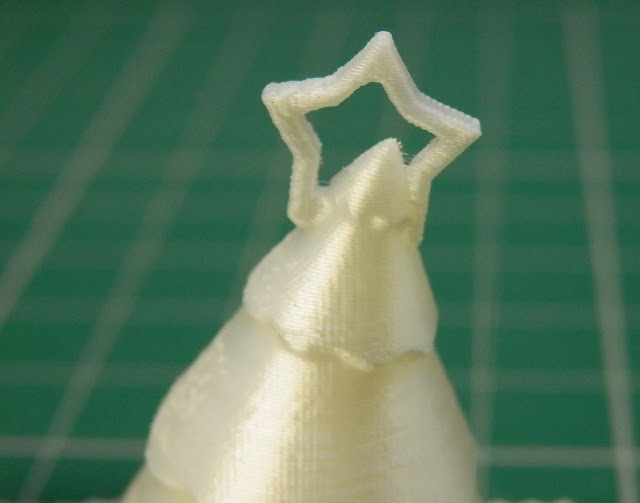 Finally, this is the really odd one - For a 0.4mm nozzle you need to tell Slic3r it's 0.45mm in diameter - with all the other settings above, this produces great results. Why use it? 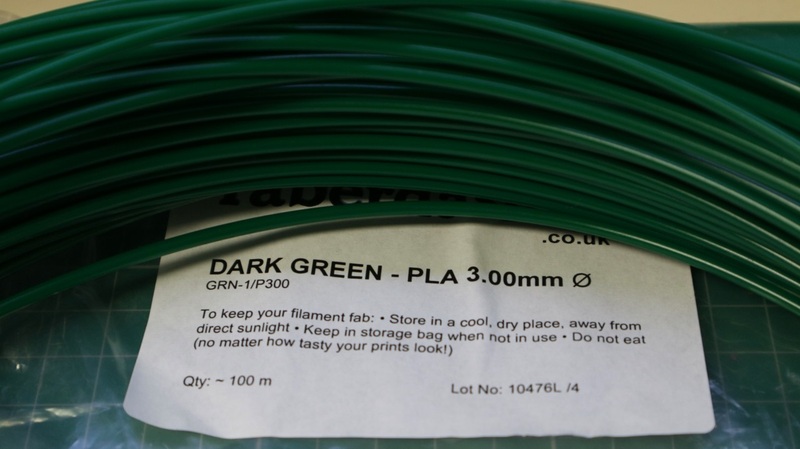 - It's just one of the most clear and optically interesting filaments you can get. 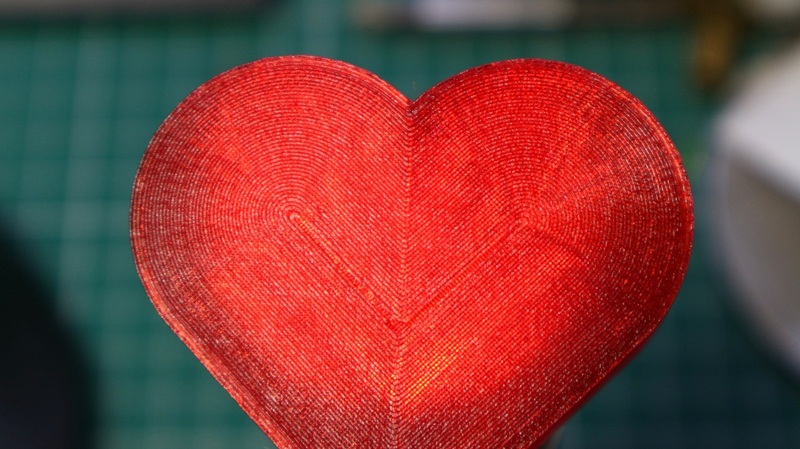 It's also a very strong material, with great layer bonding, so making objects to use, enjoy and give as gifts is high on the list of ideal uses. Is it strong? - Yes, it's very tough, impact resistant and just a tiny bit of flex. 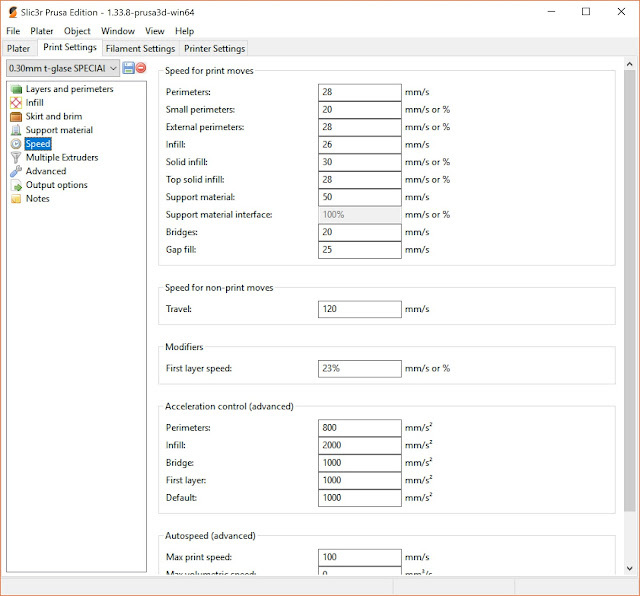 Is it easy to use/print - Yes, as long as you spend time tuning the speed, temperature and odd nozzle settings I have shown above. Do you have to dry it before/after use? - Not really, but I do dry it out before use if I want the very best clarity or optical performance. Keep it dry / sealed etc. Do i need a 'special' nozzle? - No it's not abrasive at all. All nozzles seem to work well, Bigger nozzles are glorious with t-glase. 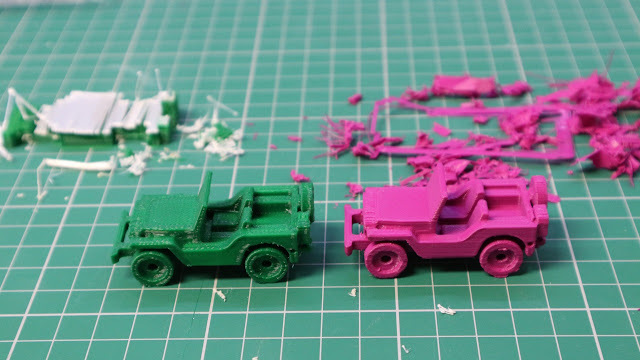 Just try it with a 1.2mm nozzle and a 1.0mm layer height, it's astonishing. Does it smell when printing? - No. Does it come on a eco friendly spool? - No :( They are usual Taulman micro-spools, can be tricky to mount as they don't have a 'standard' 52mm mount hole. 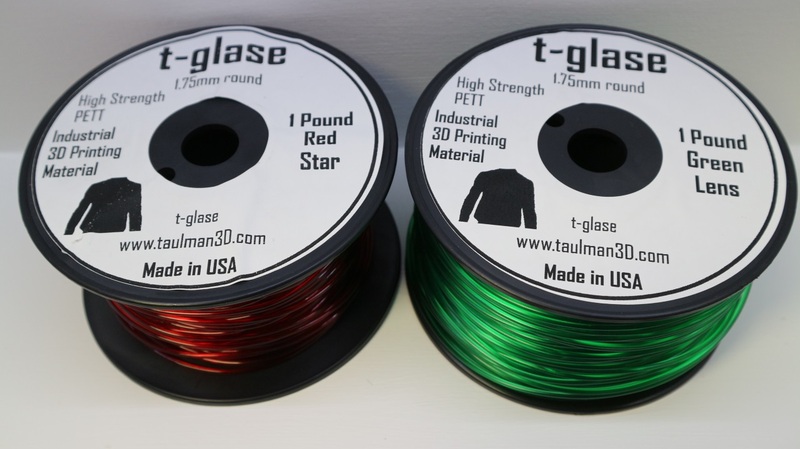 Conclusion for Taulman t-glase - If you have not tried it out yet, you are missing out. From the very first sucesful print, you will be hooked. It also not comes in more colours, that I'm going to get hold of in the New Year. It's in my top 5 list of most useful and great looking materials. I thought it would be good to check on the Ruby Nozzle at this point. 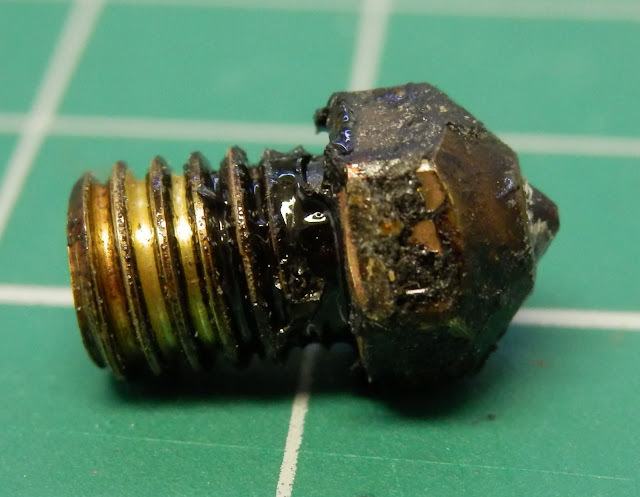 I just removed the nozzle (when it was at full 260 Degrees C temperature). It has not been cleaned in the image above. 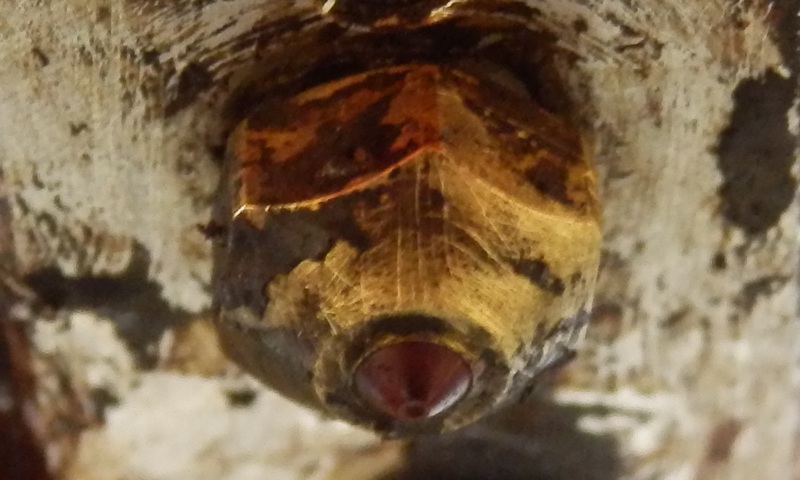 In the image below the same nozzle has been cleaned and refitted. 'Cleaned' and fitted back into the Hot-end for another print run - I'll check again in 1500 hours. I installed this first Olsson Ruby nozzle in the summer of 2017. 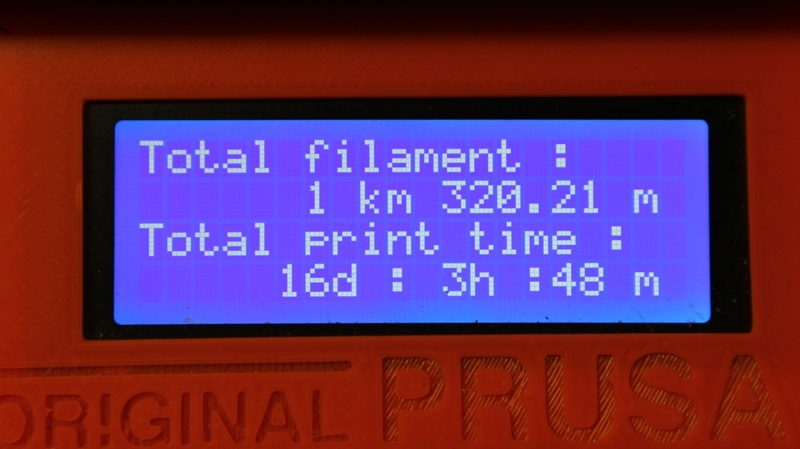 I reset the firmware timer at that point to keep track of the total print hours. This nozzle has now clocked up 16days 3hours 48mins. That's around 387 hours of constant print time with almost every single type of material I have. 1.32km of filament length (1.75mm) is also around 4.2kg of filament so far. 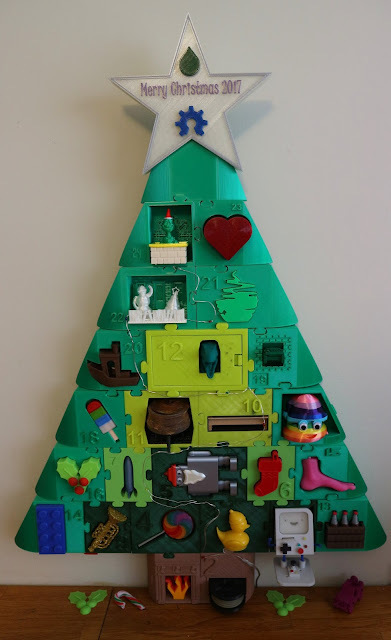 To put this figure of 387 total hours of Ruby nozzle print time into context, this entire advent Christmas tree - printed on this Prusa i3, the Lulzbot TAZ6 (also fitted with a Ruby high-flow Nozzle) and one print made on the Sigma R17 was a total print time of - 139.5 Hours. 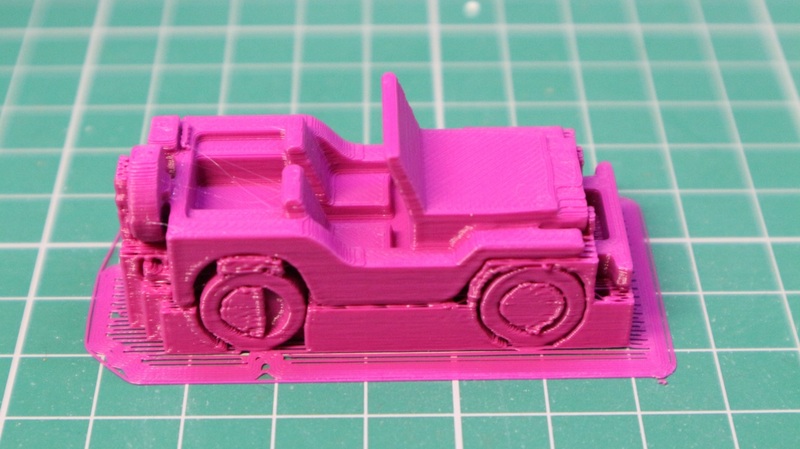 2/3 of all parts were done on the Prusa i3 MK2 with a V6 Olsson Ruby Nozzle fitted (0.4mm). 1 part was printed on the Sigma. The Olsson Ruby (Volcano) nozzle in the TAZ6 has only had around 50 hours of use, so I'll check the status at around 300 Hours. 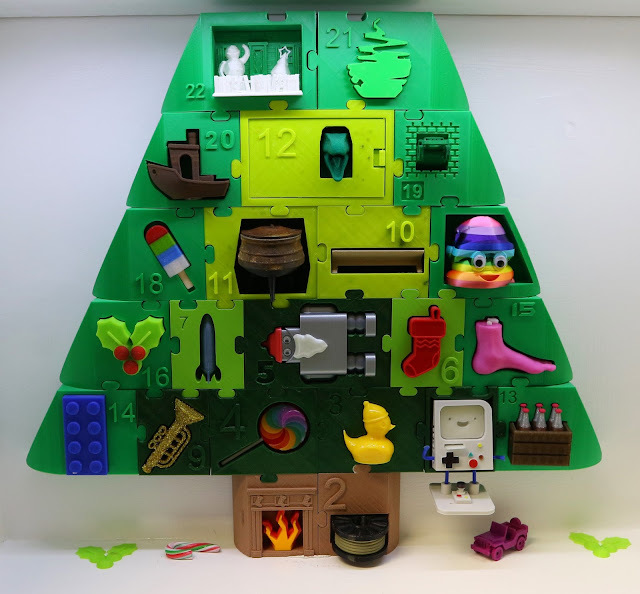 Remember this Advent tree is scaled at 150% of the original files posted. The tree sections are also scaled at 150% but only 120% in depth (to make the gifts appear to pop-out more). Can you guess the total weight of the finished advent 2017 tree? 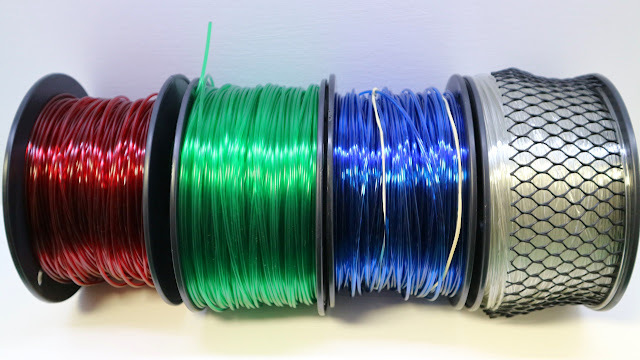 (and also how much filament has been used)? And also how tall the finished tree is? Send me a tweet over on Twitter @RichRap3D with your guess. I'll post the weight and filament used in tomorrows post. Days 1 to 24 of the Advent Christmas Tree. 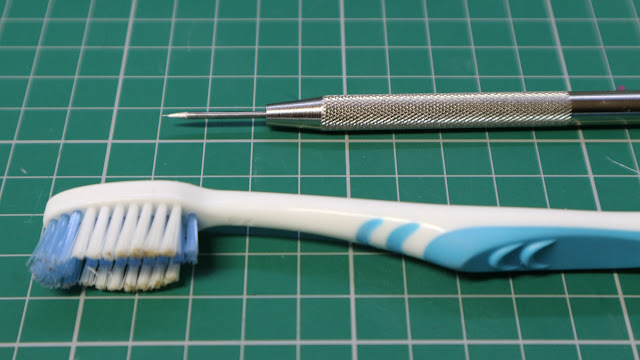 Today story is simply about making beautiful objects with 3D printing. 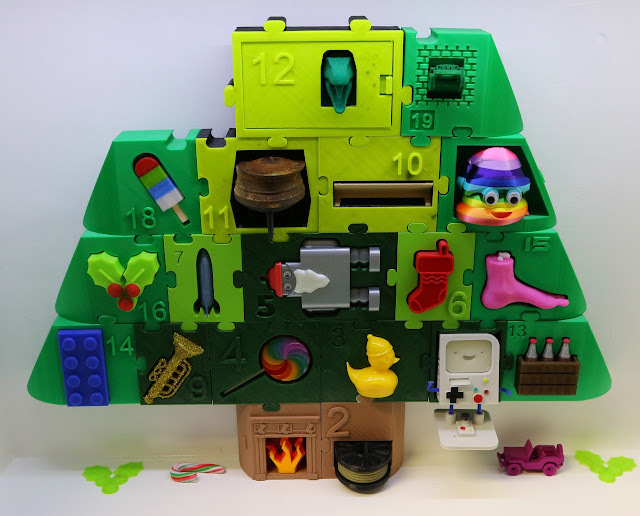 What I have now is another wonderful, creative and exciting advent Christmas tree, full of stories and interesting materials. 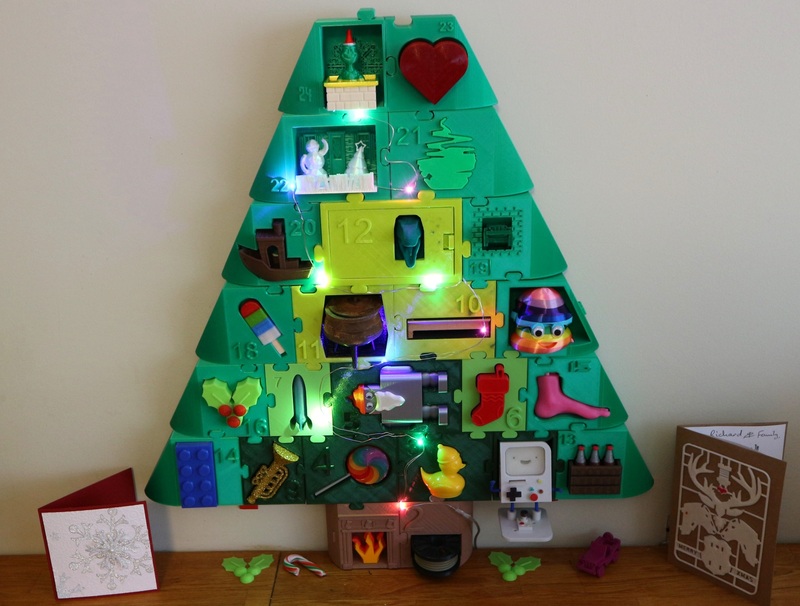 We still get out the original 2012 advent tree every year. Now we have this one too. I want to thank all the South African makers and designers for this amazing Christmas gift. it was a real pleasure to print these parts. I also hope you also learned some neat things to try yourself. Christmas Day tomorrow. Have fun. Thanks for reading and Merry Christmas everyone. My Youtube channel is here, all 3D Printing and Hi-Def video content. Day 22 gift is designed by Shaun Nadan- It's a Christmas Scene. 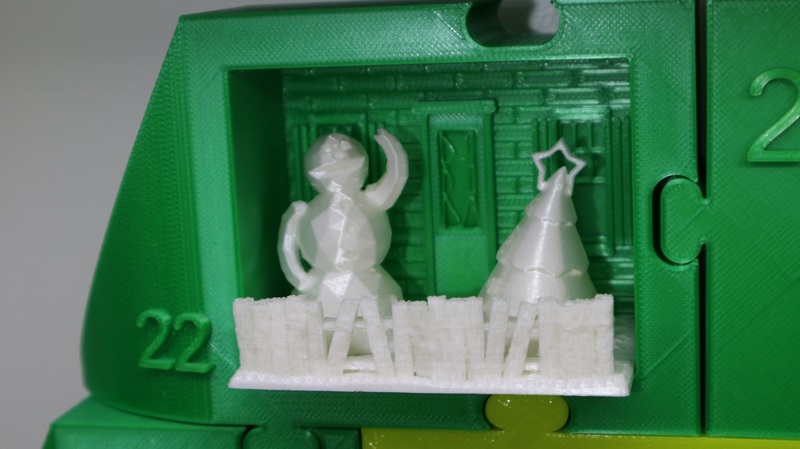 Christmas scene is printed in Polyalchemy Elixir Natural (snow white). This is a very small model, so the details really came out well. My Laybrick filament is no longer usable (around 4 years old). Laybrick is about the closest to 'snow' look, and even texture, you are likely to get in a filament. It has powdered chalk as the filler. Prints like sandstone, cold and oddly both smooth and rough at the same time to the touch. It's a little like using plaster or clay. I will get another roll of Laybrick and show you what it can do at some point in 2018. Until then I have used the wonderful Polyalchemy Elixir, for a shining version of this Christmas snow scene. I was going to tell you all about Laybrick, but I'll save that for a future post. Just one quick thing to note if you try any Laybrick materials. Do be careful what print surface you use. It can bond quite strongly to PEI, Tufnol and even coated glass. I have damaged a few heated bed / coatings using Laybrick, take care. Days 1 to 22 of the Advent Christmas Tree. Day #22 is completed. We are in to the final countdown very shortly. The story, or maybe the moral of the story today is to use materials as soon as you can. Many filament's can become brittle or unusable over considerable time. My Laybrick was a casualty of not remembering, that I still had a roll at the very bottom of the filament storage box. 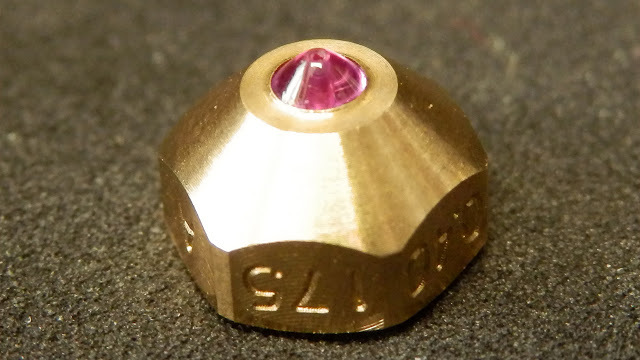 Join me next time for Day #23 - I'm also going to update you on the status of the Olsson Ruby nozzles. I plan to remove them, and inspect how they are holding up. Join me next time to find out. Last time - For Day #20 (Scaled Benchy) I printed the Benchy boat in ColorFabb corkFill material. Day 21 gift is designed by Mohammed Hassen - It's an abstract apple. Abstract apple in Fillamentum Flexfill 98A luminous green material. 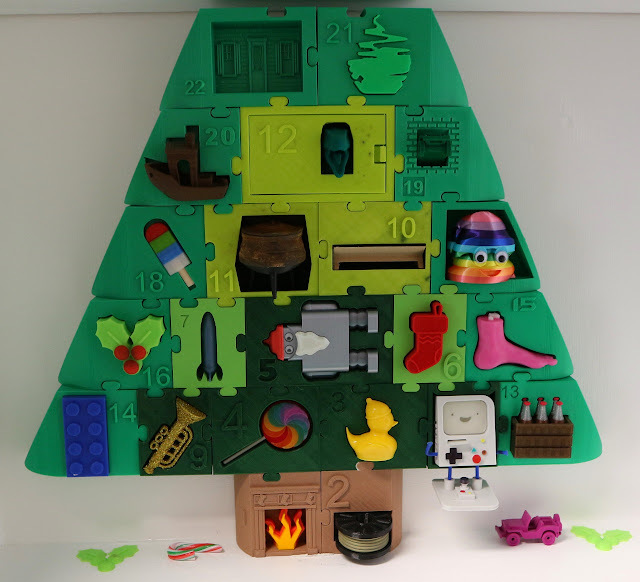 Day 21 tree section is printed in Polyalchemy Elixir. 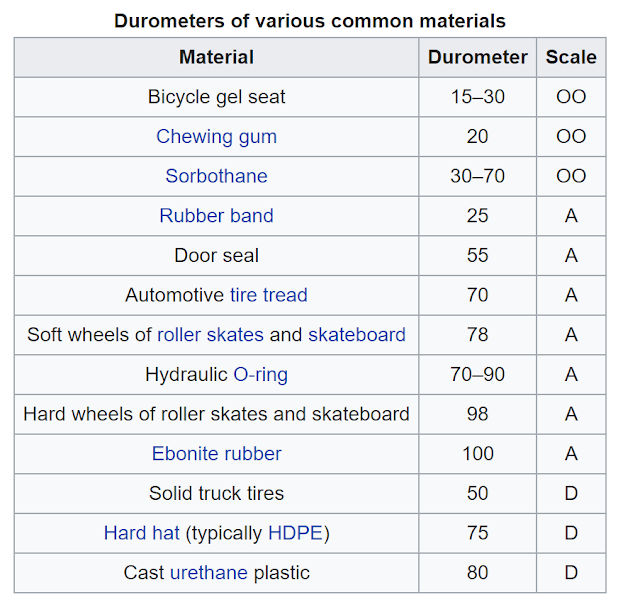 Wikipedia has a great page all about the short durometer scale (testing the hardness of a material). It's useful to know what level of 'soft/hard' material you are buying, before you choose for a particular project. Here I'm using Flexfill 98A (Shore hardness 98A or 60D). Flexfill is also available in 92A. This is a little softer, but nothing like a soft stretchy rubber band. Flexfill is ideal for projects like model car racing wheels, textured grips on products, handles etc. 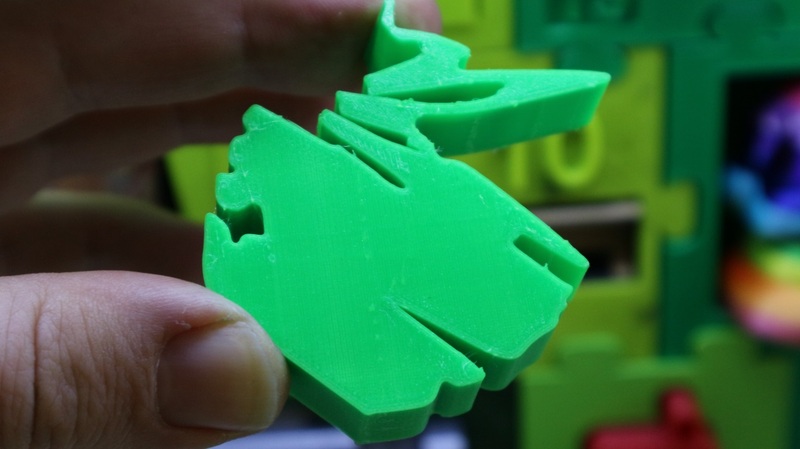 It's also great for robot parts that need some flex, but also keep their shape under loads. 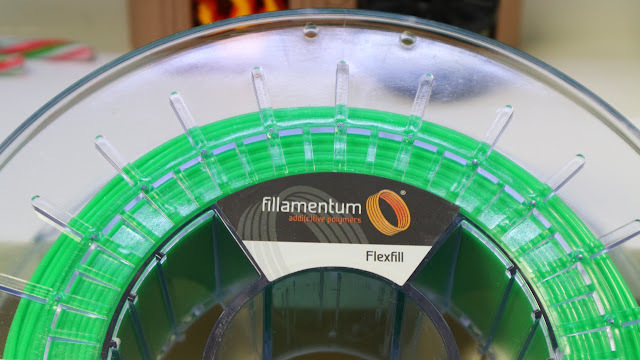 Fillamentum Flexfill 98A has a firm, but flexible finish, bends well, but holds shape and form. What settings did you use? 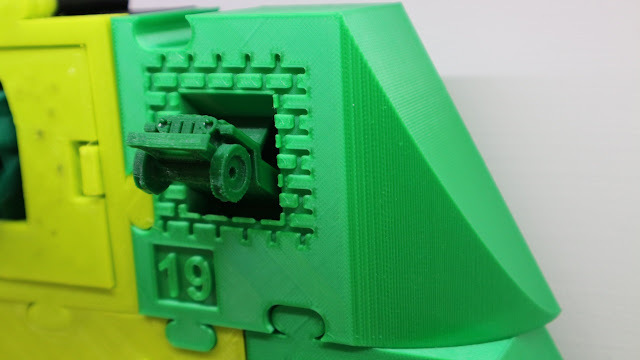 - Flexfill 98A is very forgiving with settings, it's not as easy to use as PLA, but much easier (in a lot of extruder systems) than many softer rubber materials. 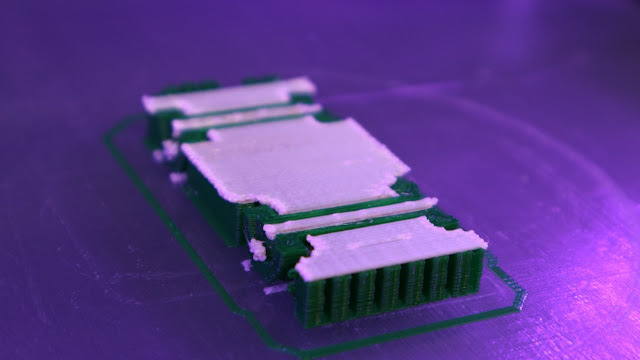 You don't always need a heated bed, but it works well with 50 Degrees C PEI surface, thinly covered in gluestick or Magigoo. First layer speed set to 55% of normal print speed. 222 Degrees C first layer. 233 Degrees C all other layers. Fans off for first few layers. +35% extra Extruder retraction length (from normal PLA settings). I never use a BRIM, because it's just to tricky to remove, and is not required. 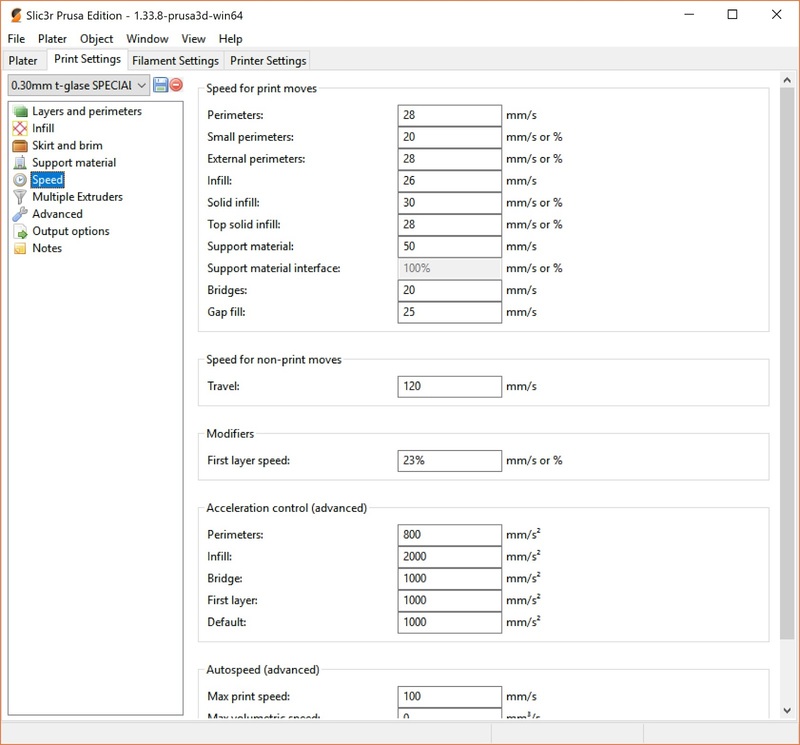 Print speed of 10mm/sec to 60mm/sec depending on your extruder setup. On an i3 MK2 55mm/sec is fine. Try not to use support, you will find it almost impossible to remove without a very sharp knife. Why use it? - It's perfect for anything that needs a slightly firmer rubber application. I use it a lot for seals, gaskets and generally any sort of rubber washer or firm grip / texture on a product. Things like gasket seals work well because they are not floppy, but do compress and seal faces together. Is it strong? - Yes, it's very tough, you will find it very hard to rip, and if you ever need to modify it, only a very sharp knife or heating / deform works. It's hard to snip, cut with scissors and you can;t file or sand it. 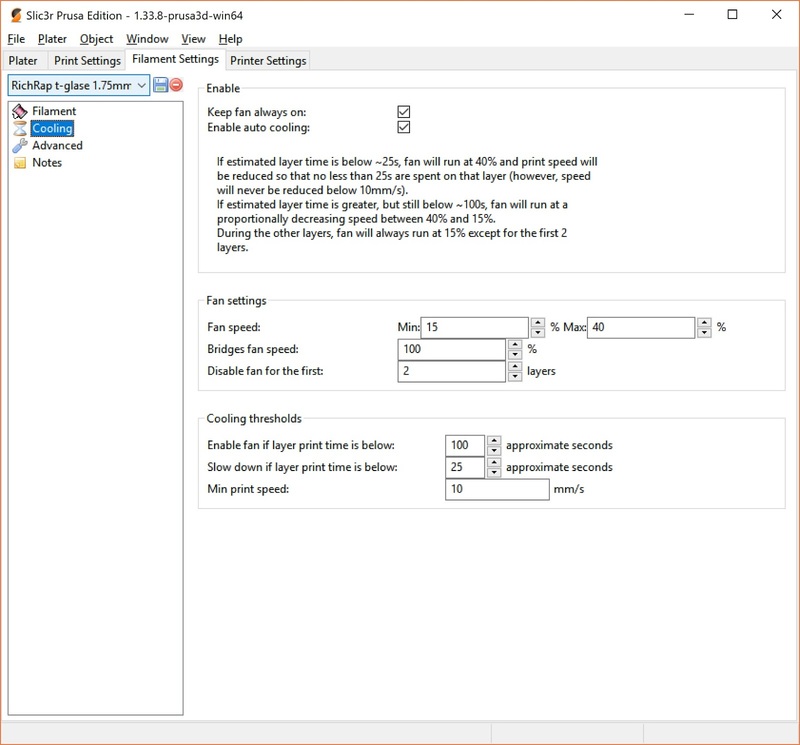 Is it easy to use/print - Yes, the biggest issue is going to be stringing, use extra extruder retraction and tune to the speed you indent to print. Do you have to dry it before/after use? - No - it should be good from the sealed pack, but keep it dry. Do i need a 'special' nozzle? - No it's not abrasive at all. All nozzles seem to work well, smaller ones may cause pressure problems with some extruder systems. Does it come on a eco friendly spool? 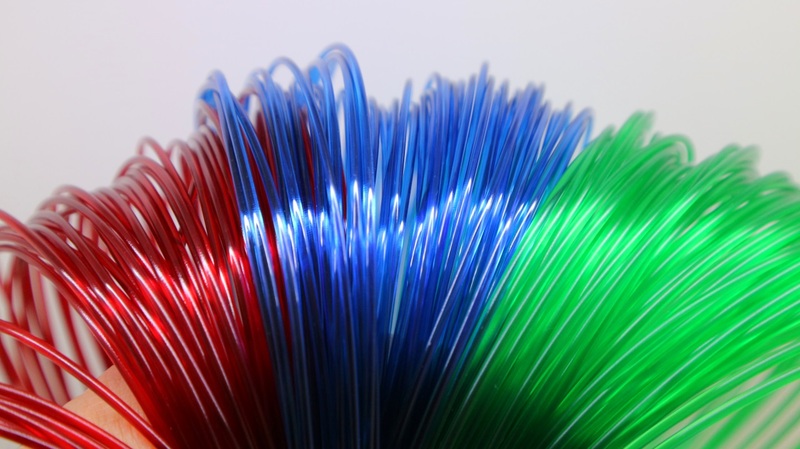 - No :( They are generic clear plastic spools, but they do have a recycle logo. I could not make out what material they are made of. 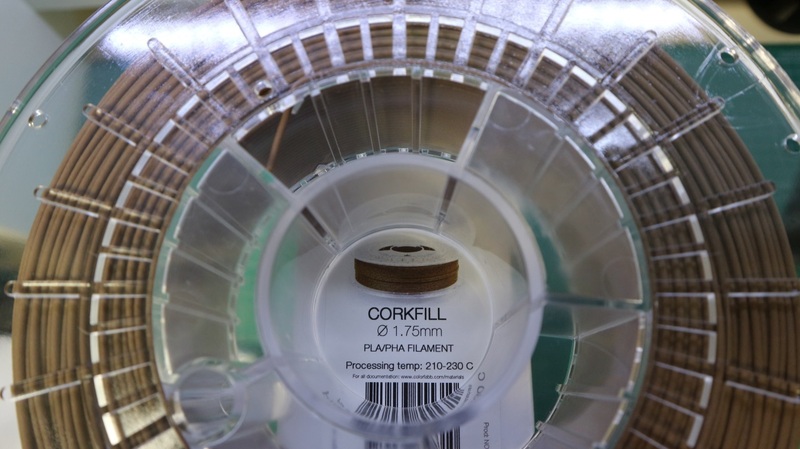 Conclusion for Fillamentum Flexfill 98A- I's a great material to have along side others. You can combine it well with PLA, ABS or PET. You are likely to be using it for some sort of flexing, or model making. 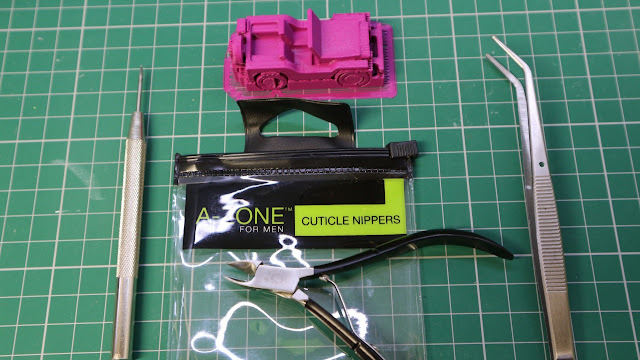 It's obviously perfect for many model tyre projects. Check out the OpenRC project for more on that aspect. 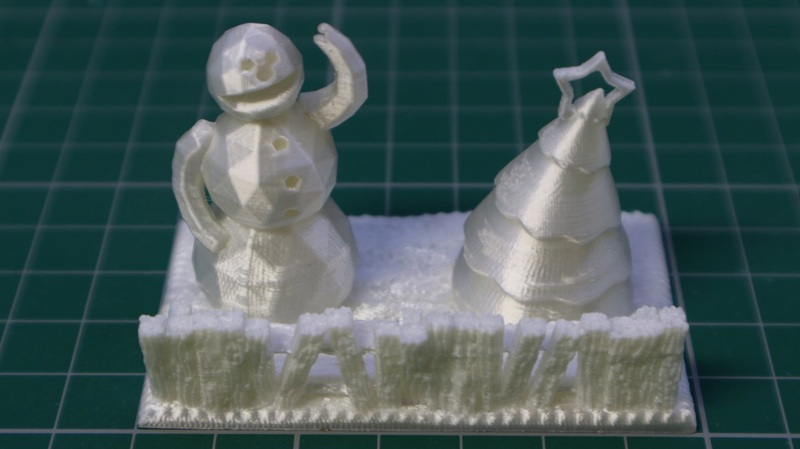 On Day 16 I also used a different and much softer flexible material, do also check that out if you are interested in printing in flexible filaments. Days 1 to 21 of the Advent Christmas Tree. I have no more room here, so it's going to be moved to somewhere in the house for the final few days of Advent. Okay, maybe I just wanted the skateboard, but now I would totally 3D Print some awesome custom wheels for it. 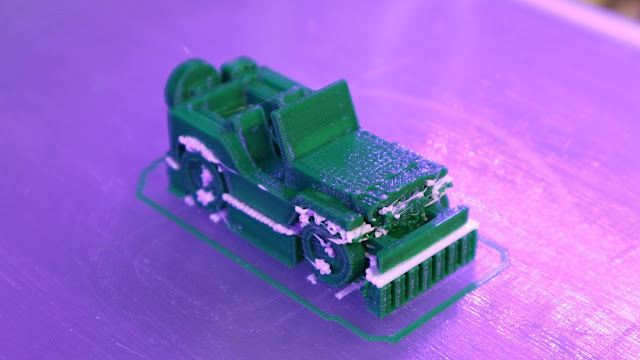 Last time - For Day #19 (little jeep) was printed using Polymaker Polysupport and Faberdashery PLA. I also discussed various support material options for 3D Printing. Scaled Benchy in Colorfabb corkFill filament. The benchy is a boat, it wants to float, so why not 3D print it with cork? I really like cork, not just this filament, but in general. It's a fantastic material. Cork is a natural product. It's also sustainable and ecologically friendly, being harvested over-and-over from the bark, not from cutting down trees. The cork industry has suffered over the last 10+ years because most wine bottles now use screw tops or plastic stoppers. Cork was and still is a better product. Luckily cork is still used in many products, now including 3D printing materials. Colorfabb corkFill is a filled wood-like material. It has powdered calk in a PLA/PHA base material. 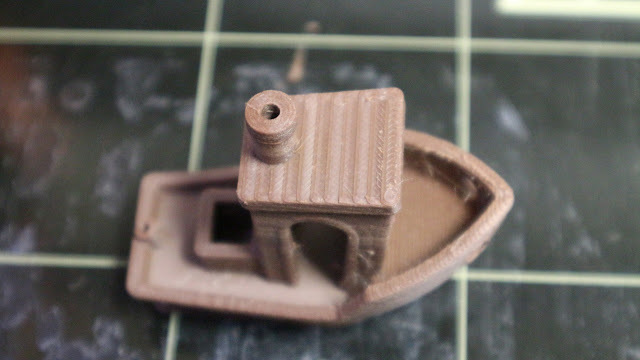 corkFill is one of my top special materials (along with bambooFill) It's easy to use and gives a really nice finish, it's quite unlike almost all other wood filament materials. Ironically corkFill actually has hard 'stiff' finish to the printed model. 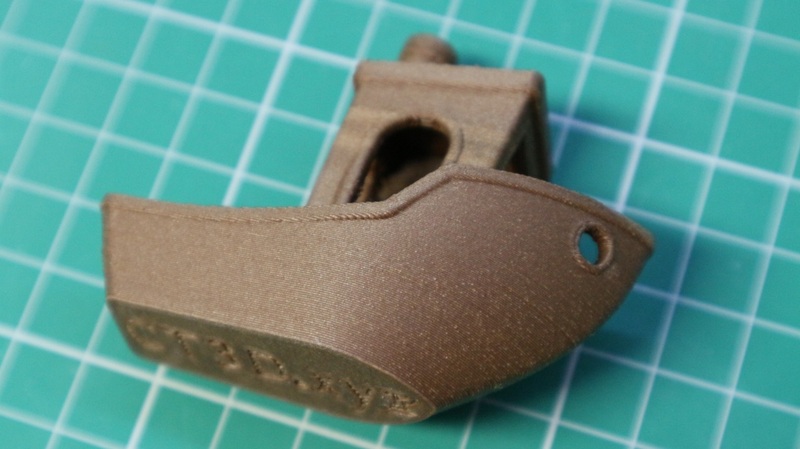 Most other wood or fiber filled materials tend to have a slightly soft 'wood' feel, CorkFill feels more like normal PLA. Like other wood filaments, temperature does change the colour of the finish, slowing down during a print can make the finish uneven, so be aware of that or change to a more constant extrusion speed. You get a nice sandy finish and it's less likely to string, blob or show defects than most other woodFill materials. You can flame-finish it to remove any fine whiskers. it's also easy to sand, drill, paint etc. Use it like normal PLA but with a slightly increased temperature of 215 to 220 Degrees C (hotter will give a darker finish), cork has some insulating properties and can handle a higher extrusion temperature than plain PLA. 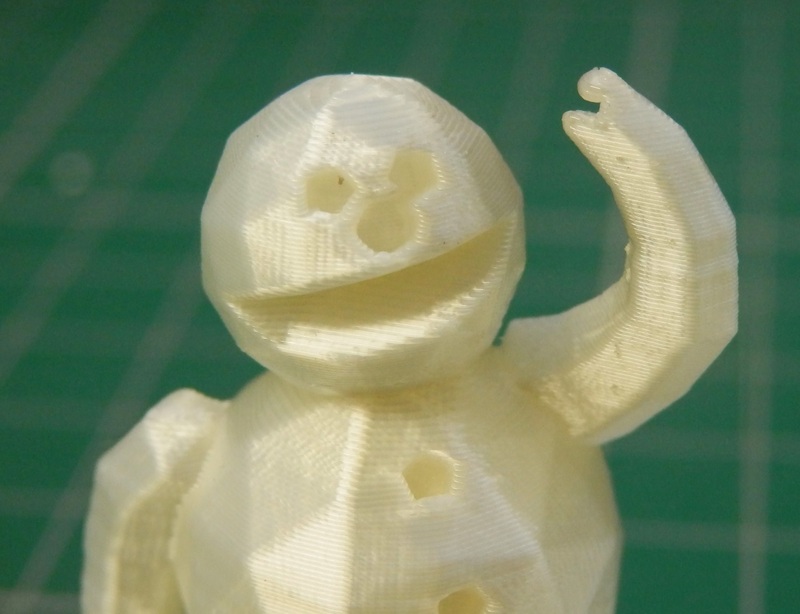 You can add a little to the extruder retraction if you are seeing any stringing or angel-hair. And a slight over-extrusion rate of +10% helps get a really great finish. Is it strong? 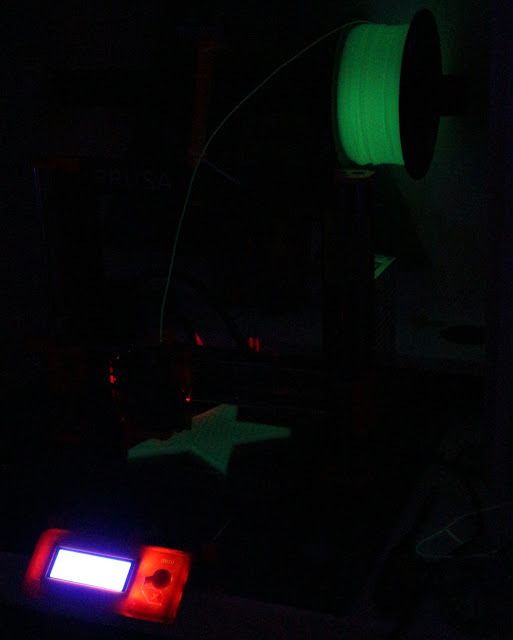 - Yes, it feels and acts like normal PLA/PHA filament. 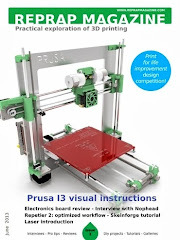 Is it easy to use/print - Really simple, just follow the advice above, and you should be good. It should be called 'easyWood'. Do you have to dry it before/after use? - No, It's not bothered at all with moisture, but as usual keep it in a sealed bag, that'll keep the dust off while not in use. Do i need a 'special' nozzle? - No it's not abrasive at all. Does it smell when printing? - Yes, it lightly smells. But for once I like the smell when printing, it's wood, but quite a soft scent. Does it come on a eco friendly spool? 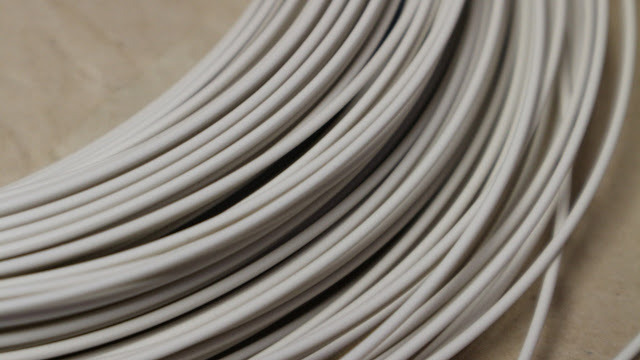 - No :( They are the ColorFabb Clear PC spools at the moment. Conclusion for ColorFabb corkFill - It's a great wood like material. Strong, solid and not so much like spongy cork, but easy to use and enjoy. I like handing someone a corkFill object, but the don't often guess what it's made from. Days 1 to 20 of the Advent Christmas Tree. 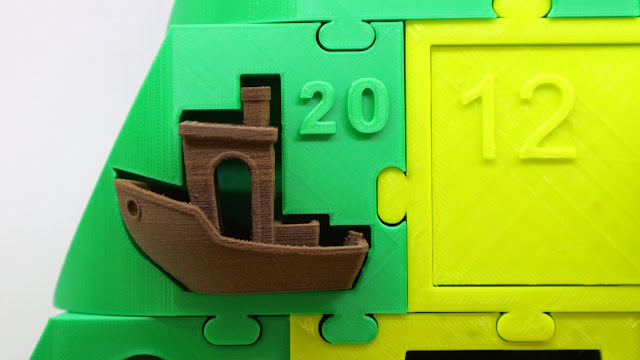 Today's story, when anyone asks about the little brown boat in Day 20, will be about developing, making and using sustainable materials in the 3D printing process. 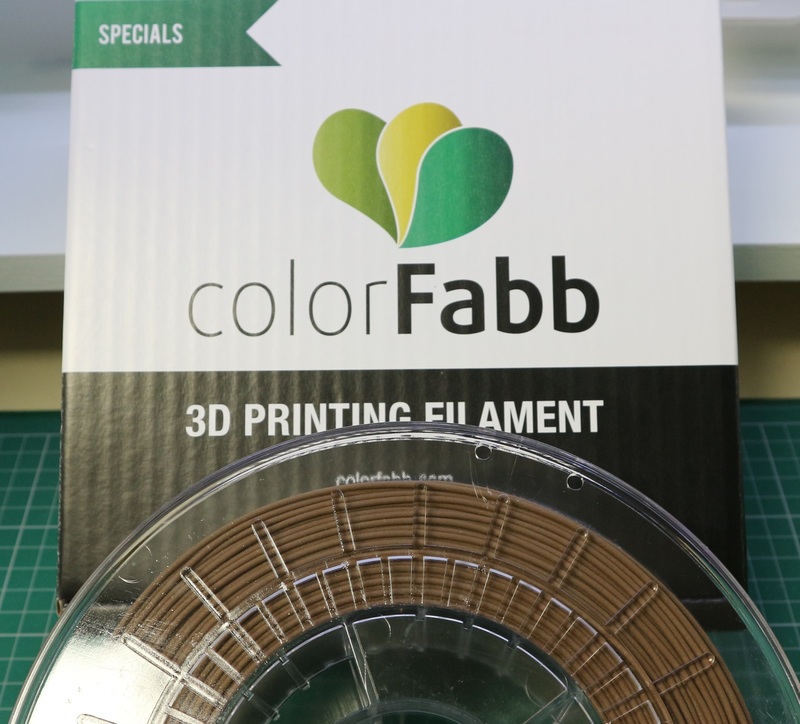 As I type this, ColorFabb also has corkFill on Christmas offer, along with other materials, so you can snap up a roll for 24.75 euro's (ex tax). That's a good deal. Last time - For Day #18 (Popsicle (Ice lolly / Ice-pop) was printed using Acrylic (PMMA) filament from E3D. Day 19 gift is designed by Gerhardt Breedt - It's a totally awesome little Jeep, with a lot of detail. 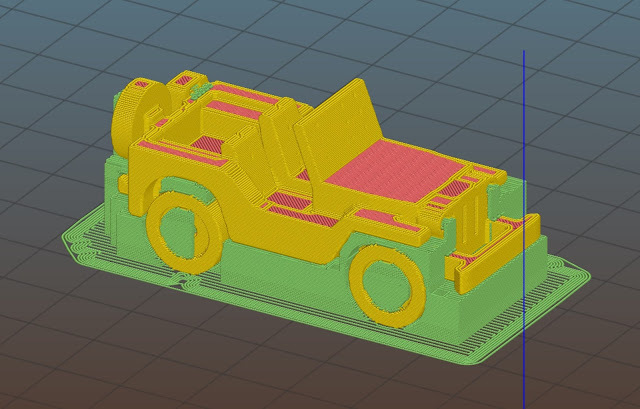 Because this model is a little more complex to print, and requires the use of support structures, today I'm giving advice about the use of different support materials available and how well they tend to work. 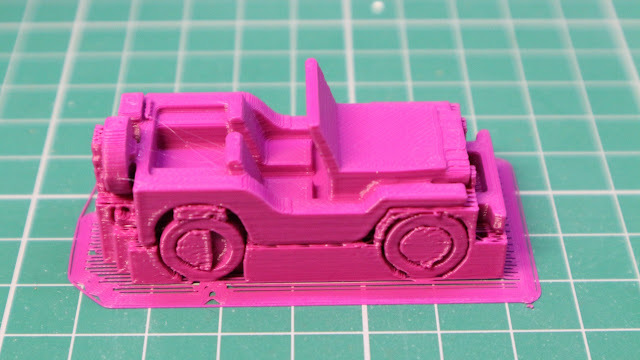 First let's look at what a 3D print will look like if support material is enabled using a single extruder machine. It printed just fine, but now you have to remove all that support material. Have a guess how long the above support removal was, I'll tell you down below, after we look at the alternative method. Another reason for doing this intensive advent calendar every day, was to test out the Olsson Ruby nozzles. They are doing really well, so today they get a short break. I will be using the Faberdashery PLA and Polymaker Polysupport in the BCN3D SIGMA R17 3D Printer. Here I am using the support material in a different way, it's an interface rather than full structure. 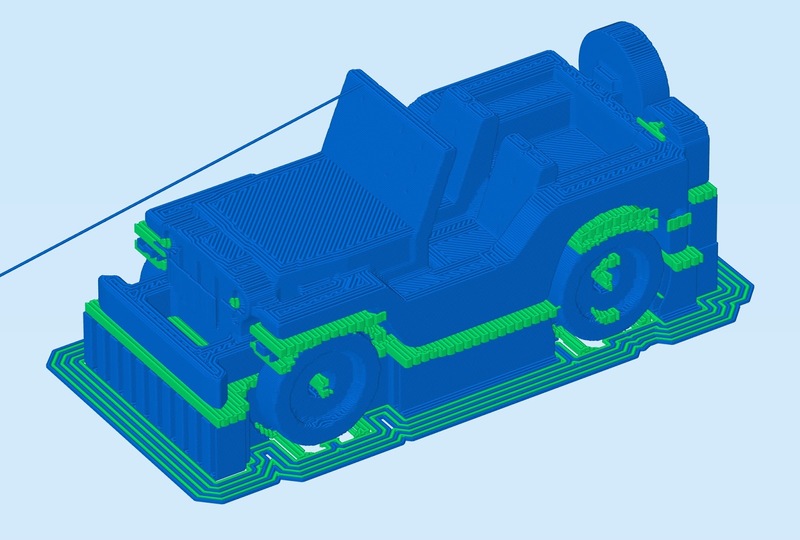 The above Gcode image shows the model car in blue (PLA on left extruder), with a blue support structure (also in left PLA). 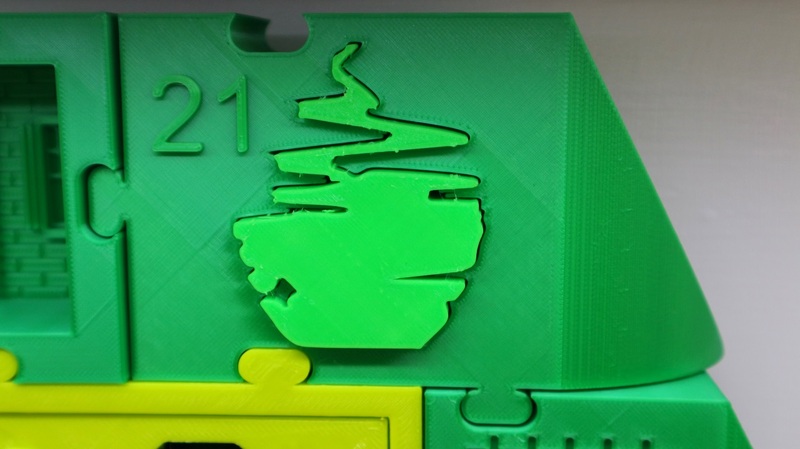 The interface (Dense support material) between lower PLA support and the model is shown in green, and is using the right extruder fitted with Polymaker Polysupport. 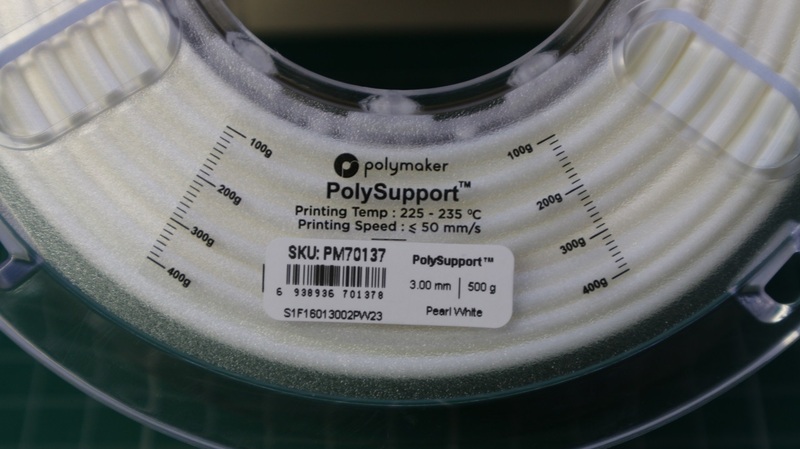 The main PLA material is used for both the model and 98% of the support structure, just the interface is in Polymaker Polysupport. 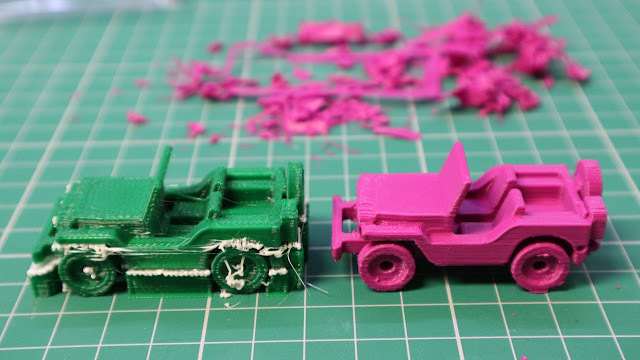 Printed great, no problems at all - Polysupport prints a lot like PLA (just slightly higher temperature). It comes off clean and easily. Just a quick brush and a poke here the there. The alternative Green Jeep, using Dual extruder 'IDEX' SIGMA PLA and Polysupport was exactly 1 minute and 18 seconds. That was including brushing time, I also did not need to use a flame for cleanup. With big and complex print projects, a break-away support material saves you many hours of cleanup. The material basically pays for itself in time saved. You also only use a small amount of it, when using it as an interface layer as I have above. 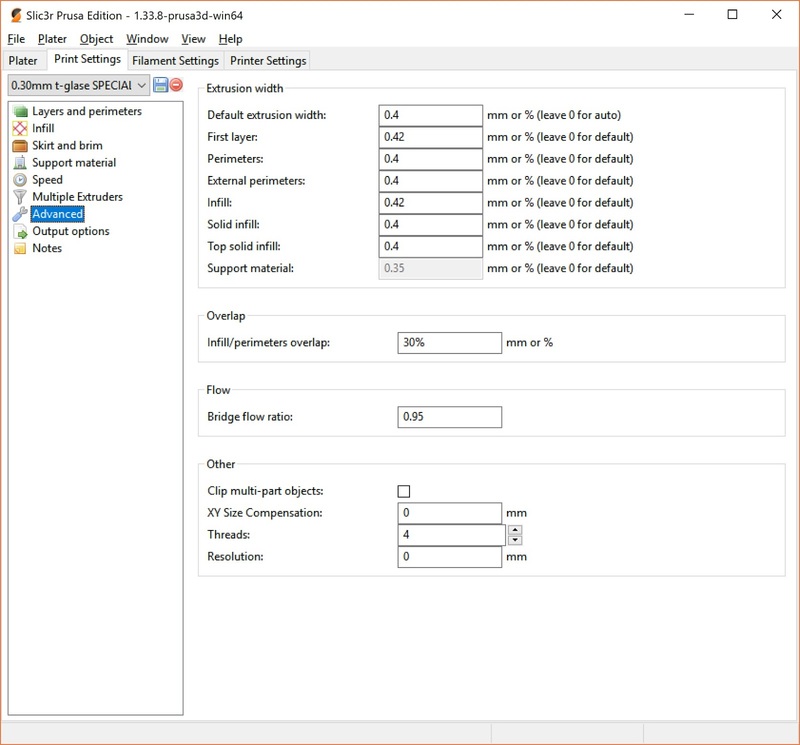 The only reason you may want to use it for full support, would be if you were using an expensive material like Bronzefill, you would not want to waste Bronze material as supports. 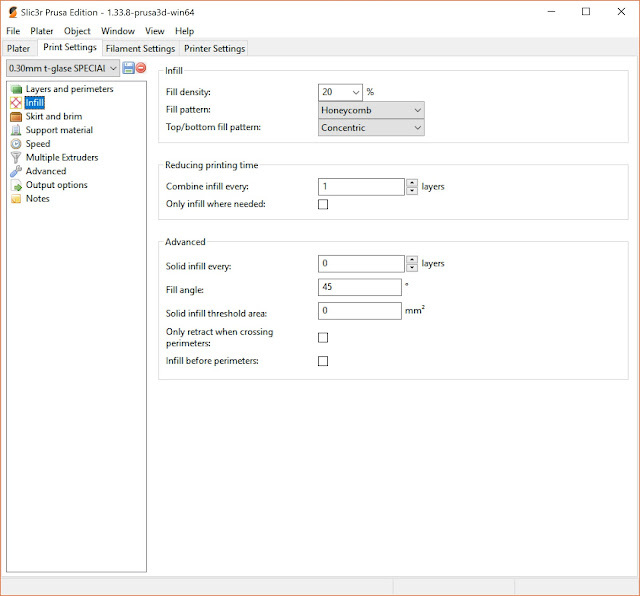 I think I'm going to do a few more blog posts on different support materials and the best settings to use (in New Year 2018), it was not long enough today to really go into full details about all aspects of support structures and other materials available. With that in mind below are my top-tips, advice and general experience of support materials. There are other options for a dedicated support material. PVA is often talked about as a soluble support material, designed for use in dual or multi-extruder systems. But it's usually a massive pain to use. General conclusion for PVA - I have wasted more time trying to print with ‘PVA’ than any other 3D printing material. It is possible, just not sensible or normally worth all the effort. It’s only fun/exciting and interesting the first time you try to use it. (I basically HATE it now). Water soluble, good but also leads to many, many of the problems below. 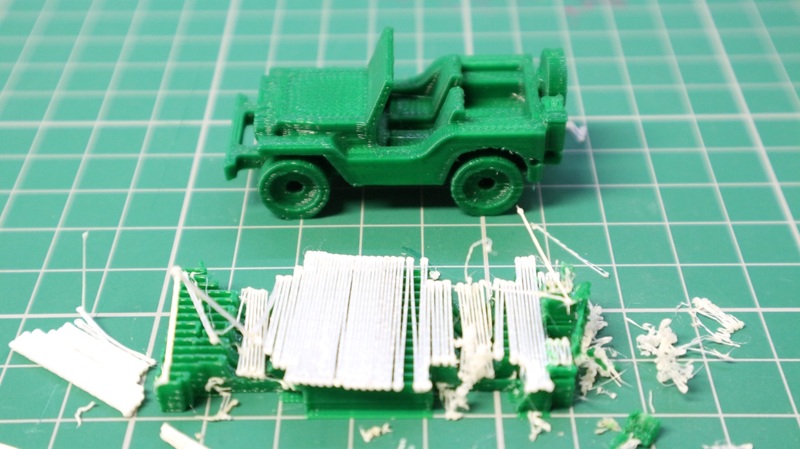 It’s very soft; filament deforms easily in extruders and does not pop-back into shape – it just tends to get squashed / squeezed - and then stops feeding/extruding. It will ‘cook’ in the hot-end – don’t go over 190 Degrees C for any long period of time - (long, being more than ~15 minutes) – take it out of the hot-zone. It’ll often stop working (extruding) half way into a print job. Few people make it, and many wished they didn’t when customers complain. It will take on moisture, and in some cases become destroyed / useless. It does not stick well enough to many materials, so not great at building on top of a material like PLA/ABS. You really need to use a lot of it – dense supports for it to usually be successful – cost / time / risk of print failure increased. It can leave residue inside the hot-end, causing problems if not fully cleaned out. 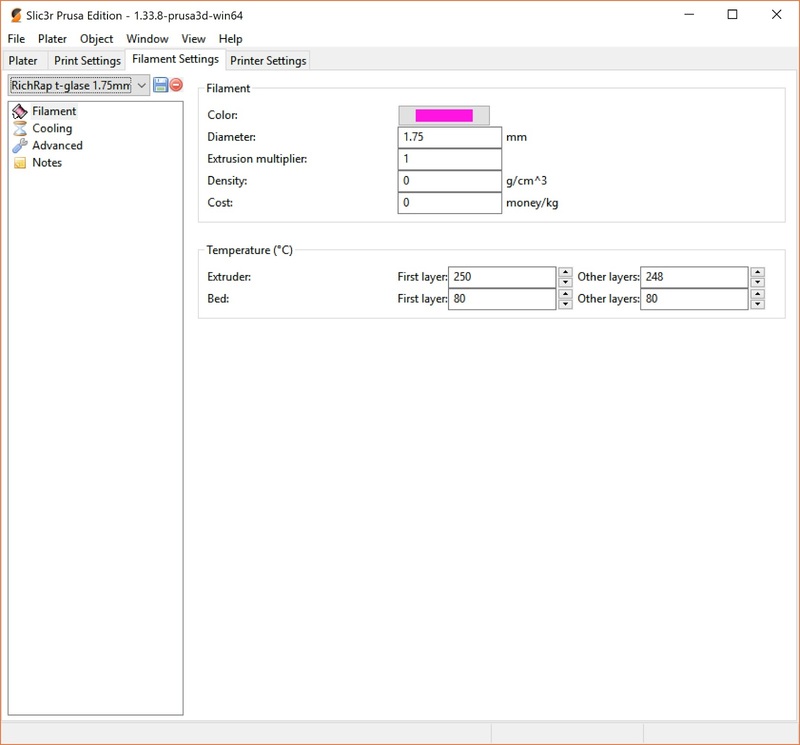 Most 3D printers (extruders / hot-ends) are not setup / designed to use PVA. 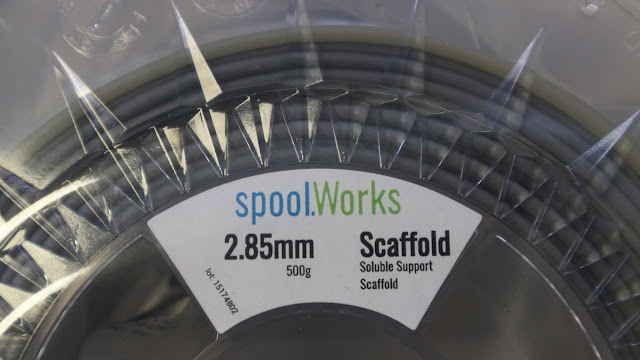 General conclusion for E3D Scaffold - It's so much better than PVA, but still not great in every machine or extruder setup. I can get it to work really well in my SIGMA that's fitted with Bondtech extruders and E3D V6 Hot-ends. It's just about perfect (apart from the general moisture problem). Unfortunately in the standard BCN3D SIGMA R17, It will not work well enough, or for long enough to be of any use. 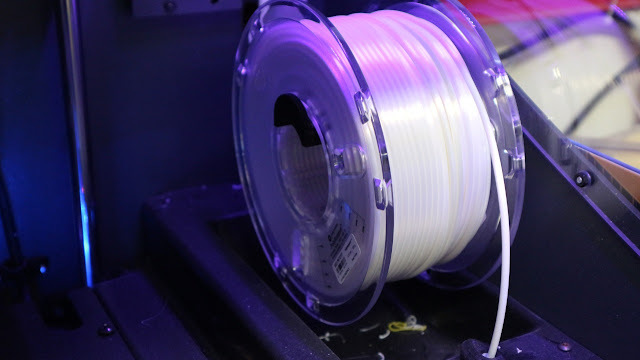 I really want to see a water soluble support material in general use, but until a formulation actually delivers ease of use in more 3D Printers, I'm going to find it hard to struggle on with PVA based materials. It is better and easier to use than a standard PVA. Water soluble and also break-away easily. Compatible with some materials PLA/PET, and tends to stick slightly better than most PVA only materials. It’s grey, which actually makes it easier to see if it’s extruding well. It’s still quite soft. In some extruder systems this will still be a problem. Moisture will still damage this filament, keep it dry and out of sunlight. It’s slightly less prone to ‘cooking’ but still use under 190 is possible and retract out of the hot-zone when not being extruded. It’s about the same price as PVA, that’s good because it can actually work, unlike many PVA’s. It seems less prone to leaving immovable residue inside the hot-end, but it will still require regular cleaning. Still causing problems if not fully cleaned out. General conclusion for Polysupport- It's so far the only support material that delivers on ease of use. For me it's the only dedicated support material worth using at this point (for my needs) It is not ruined by moisture, and that's a big bonus. It also works in the SIGMA extruder system. 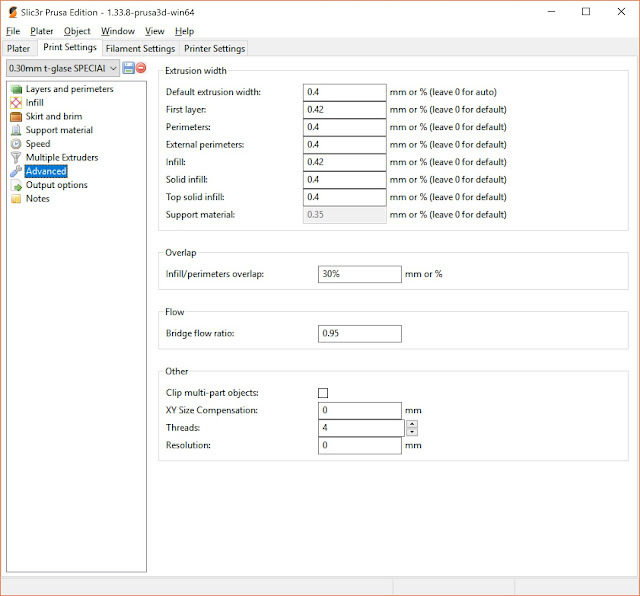 every other PVA material does not work as expected in SIGMA. 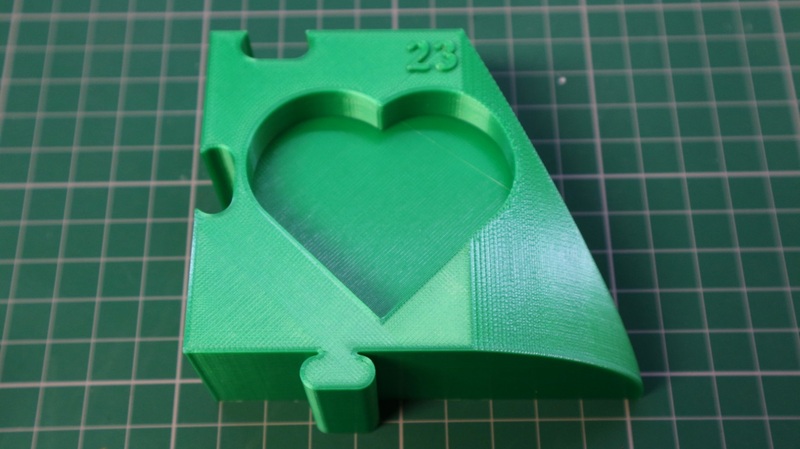 It is a dedicated support material, and you can also print objects with it too. It’s like using a normal PLA material. Quite easy in most systems. Compatible with common materials PLA/PET/ABS, the bond is just strong enough to hold, but straightforward to remove from most materials. It does not have a moisture problem, but keep it sealed when not in use. 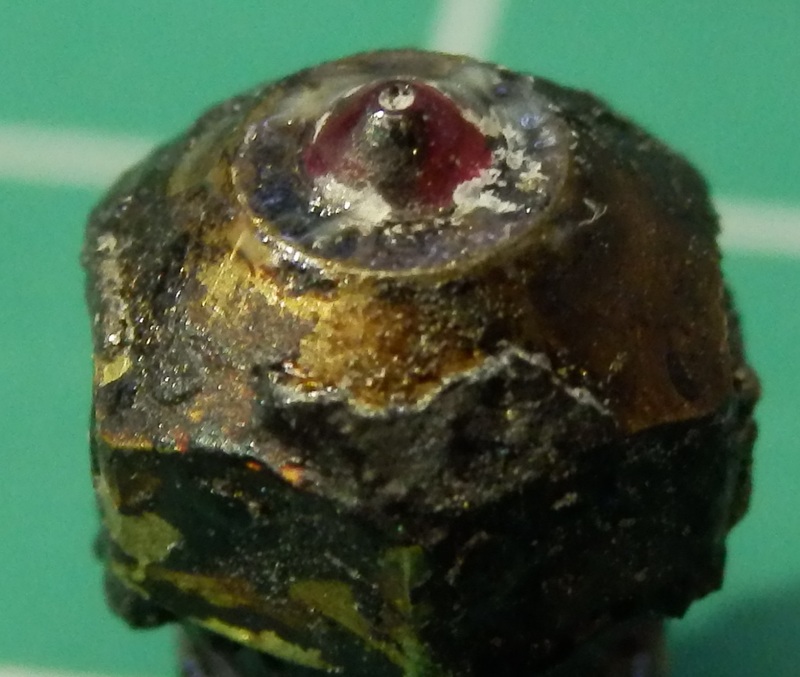 It does not ‘cook’ in the hot-end, does not leave permanent residue. It’s not water soluble, so you will still need to break-away, can’t be used in the same way a water soluble material could. It’s quite expensive - but I also just demonstrated how it saves time and it ACTUALLY WORKS! - Bonus. I'll go more into support materials, settings and techniques in a future blog post. But please ask questions and I'll make sure they are included next time. Days 1 to 19 of the Advent Christmas Tree. 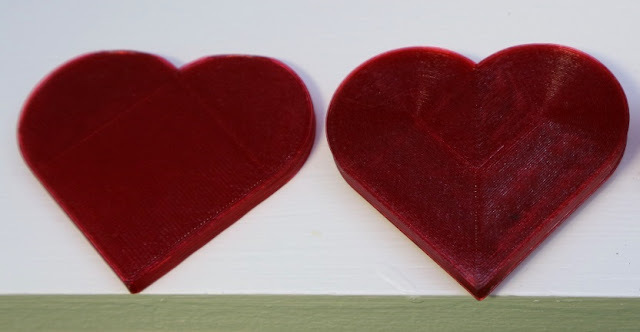 Today's story is all about reminding people that not everything can or should be 3D printed, and the things that use support material structures can be a right pain, if you don't choose the correct materials.